A group of walkers was rescued from a Lake District accident blackspot just 24 hours after a man had fallen to his death at the same site. 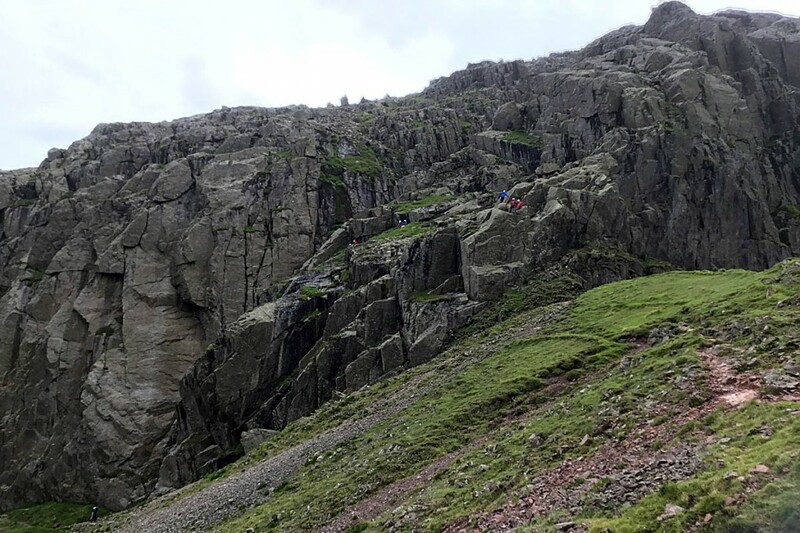 Rescuers warned that the route on Broad Stand on Scafell is not a walkers’ path and should only be tackled by those with climbing skills. Wasdale Mountain Rescue Team was called out about 2pm on Thursday when five walkers got into difficulty on steep ground above Mickledore, the col between Scafell and Scafell Pike. The team said the incident could have been a repeat of the tragic fatality the previous day when a man in his 20s fell to his death on Broad Stand. Richard Warren of Wasdale MRT said: “Five male walkers in their late teens made a navigational error on the summit of Scafell thinking they could walk directly between Scafell and Scafell Pike and found themselves cragfast on serious ground. “One did manage with great difficulty to get down but only by falling and injuring his lower leg and suffering a few abrasions. Fortunately he was very lucky not to have sustained more serious injuries. The injured man had managed to descend via Mickledore Chimney, which Mr Warren said is not a recognised descent route. “The message is very clear regarding Broad Stand on Scafell: it is not a walkers’ path; it is in fact a serious descent or ascent that should not be undertaken lightly unless you have climbing skills and a rope. “Finding a route down to the final rock step in bad weather is extremely challenging. The rock is extremely slippery when damp. While the team were attending this incident, a further call came in from Cumbria Police for a walker who had fallen off the Corridor route into Greta Gill sustaining injuries. Mr Warren said: “Two team members were diverted to this incident to administer casualty care and analgesia before evacuating the casualty by Coastguard helicopter and taken to Furness General hospital. A further call then came in for a third incident on Great Gable followed by a fourth to check out walkers on the boulder field path on the Wast Water Screes. The team final stood down about 9pm. The Broad Stand rescue involved 12 volunteers from Wasdale MRT. How many accidents and call-outs could be avoided if we just placed a few discreet metal aids such as are common in places like this in the Alps. A couple of metal rungs; the odd spike; a short length of wire or chain could save so much heart ache at several of the Lake District accident black spots and would,in no way, spoil the beauty or experience of the location. Not many call outs at all as these only constitute a small number of total call outs. That would have been of no use on Broad Stand where a full length ladder would have been needed and probably more. It does not need any aid putting place because it is not a walking route. Broad Stand's not for walkers, pure and simple. I'd hate to see metal aids in the fells; most of us go there for natural beauty. Metal aids aplenty on indoor walls and bolted climbing routes. Well done Wasdale Mountain Rescue Team on their commitment & expertise. It is worrying that Broad Stand would be considered by walkers but I met two men yesterday wanting to know if Lord’s Rake or Broad Stand were the best way onto Scafell. They had a map but hadn’t seen Foxes Tarn as the obvious route from the top of Mickledore, a worrying trend. The usual story: people don't inform themselves about the difficulties and/or cannot 'read' the terrain. In Austria, where I live, the various aids are (all too) common, but if you put them in place you also need markings to guide people to them. There won't be much support for that sort of thing in the UK. Perhaps a sign at the Broad Stand end of Mickledore warning that it is a climbing route only. I know signs are anathema to all of us who walk the fells but if it saves a life! Repair of the Foxes Tarn path would be a good starting point so that a more obvious path could be seen - a simple slate sign stating 'Scafell Pike' with an arrow towards the Foxes Tarn footpath on the approach to Sca fell really wouldn't be so terrible. The accidents occur generally with people descending while trying to get to Scarfell Pike so any metalwork would be irrelevant. The problem is not a lack of signs. In dry conditions the bad step is no big deal but it is very tricky when wet. I have rigged it with ropes for runners doing the Bob Graham round and it can be made safe. What it needs is a few bolts and a short length of chain.